Voragine: Also known as “The Chasm,” the Voragine crater formed in 1945 in the northeastern part of Etna’s Central Crater. Initially a small pit, it gradually widened by collapse and a few strong eruptions in the 1960s to 1980s. In the early 1990s the diameter of the crater was about 350 meters. Bocca Nuova: Born in 1968, in a similar manner as the Voragine, the Bocca Nuova (“the new mouth”) crater formed in the western part of the Central Crater. It grew from the collapse of its unstable vertical walls, extending over the whole southwestern half of the Central Crater, and ate into the southwestern side of the Voragine. By the mid-1990s its diameter had grown to 350-400 meters. Northeast Crater: This crater began its vigorous life in 1911, as the ground on the northeastern side of the main summit cone collapsed, probably as magma withdrew under the flank of the volcano. A cone began to grow at the crater in the 1950s and gradually filled the initial collapse pit. In the late 1970s the Northeast Crater grew to become the highest point on Etna, but later its summit collapsed. Southeast Crater: During a flank eruption in 1971, a new vent opened on the southeastern side of the main summit cone. This vent, now named the Southeast Crater, became active again in 1978 and has erupted frequently since, building a large cone that by 1997 stood about 180 meters above the elevation of the initial vent. July After two years of volcanic rest, Mount Etna’s Bocca Nuova summit crater begins the prelude for Etna’s summit eruptions. 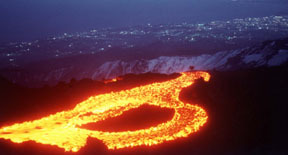 August Etna’s Northeast Crater slowly intensifies, punctuating the year’s end with crescendos of violent eruptive episodes through June 1996. August The Northeast Crater fades out to a low rumble. November Bocca Nuova picks up the tempo again as the Southeast Crater coughs back to life in spurts and clots of lava after five years of silence. A small cone forms on the floor of the Southeast Crater. July The Southeast Crater and Bocca Nuova take center stage. Cones grow around Bocca Nuova’s two main vents. Lava fills the Southeast Crater and overflows onto its flanks. Mild eruptive activity (ejections of incandescent lumps of lava) begins in the Voragine. December Vigorous eruptive activity continues at the Bocca Nuova and the Southeast Crater. January Hundreds of small earthquakes on Etna’s western side arouse villagers’ fear of a flank eruption. Bocca Nuova subsides, allowing the spotlight to fall on the Southeast Crater. March The Northeast Crater interrupts the Southeast Crater’s solo with a brief but intense eruption. June The Voragine takes over the show at the summit with violent explosions, the strongest on July 22. The Southeast Crater then falls into a strained silence for six weeks. September The Southeast Crater breaks its rest with a series of eruptions that build up its cone to more than 3,250 meters until early February 1999. February The Southeast Crater’s final eruption fractures its cone on Feb. 4, opening a new fissure at its southeast base. Lava continues to flow from this fissure for seven months. September The Voragine explodes with lava fountains 1,500-2,000 meters high, showering nearby towns with scoriae and lapilli. Later that month the Bocca Nuova and the Northeast Crater join the concert with episodes of lava fountaining and Strombolian activity. October Bocca Nuova wails, rapidly filling with lava until it overflows, sending repeated attacks of lava onto the mountain’s west flank. January The Southeast Crater begins a new solo, trumpeting up to as many as three eruptions a day. April The Southeast Crater continues its overture with more than 50 eruptive stanzas this year. On April 26, an airbus with as many as 147 passengers and crew encountered lapilli fallout just after the 51st eruption of the Southeast Crater. Sctratches heavily damaged the windshields of the airplane, but it managed to return safely to the Catania airport.